Evie is a beautiful 8 week old mix breed puppy, whose owners adopted from a local rescue organization. I am a huge proponent of adopting rescue dogs, so I commend Evie’s family for making this lifesaving decision. 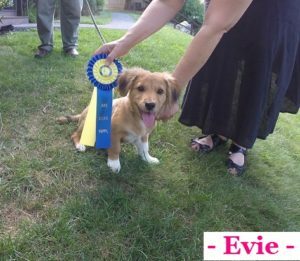 Within just days of her arrival, Evie’s family looked for dog training in Irvington NY and enlisted my help. The two biggest challenges for new puppy owners are housebreaking and puppy biting. Both are inevitable aspects of owning a puppy. The key is to appropriately handle both of these issues, so you can fully enjoy your new four-legged family member. Inappropriately training your puppy through these issues, will not only lead to frustration for you, but they will result in an adult dog who bites and has frequent accidents in the home. That’s why early training is so important. 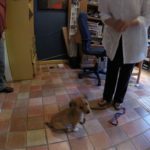 Once we covered housebreaking and puppy biting, we moved onto obedience training and leash walking. Many puppies find walking on the leash to be a difficult task. They either pull their owners down the road or “lock up” and refuse to move. How do we resolve this? Proper leash walking technique that helps create an effortless walk with your dog. Fifteen minutes of training now, will create a lifetime of relaxed and enjoyable walks. Every owner wants their dog to “Come” when called, “Sit” and STAY (staying is the big issue for many). Why won’t your dog simply listen? It’s normal, dogs do not inherently know these commands – we must appropriately teach it to them. The operant word is “appropriately”. The reason why in-home dog training is preferred my many, is the fact that we can tailor the training specifically to your dog. That way we are able to make strategic improvements and progressions, so your dog achieves the true reliability you are looking for. Evie is very lucky to have found such a terrific family. Even though her owners are experienced dog owners, they understood the importance of early training. So regardless if you are looking for dog training in Irvington NY or anywhere else, get started with training your dog now. Beau and Mason are two wonderful and happy puppies! 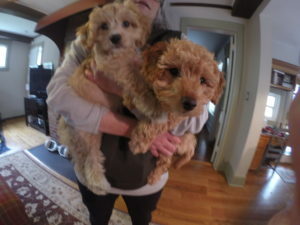 Beau is a 15 week old Cavapoo and Mason is an 11 week old Goldendoodle. Their family wanted to make sure they are raising their puppies the correct way right from the start, so they contacted me for in-home dog training in Irvington NY. My puppy training program focuses on the very successful housebreaking protocol I use with all puppy clients, crate training, how to properly handle puppy biting, socialization, leash walking, and beginner obedience training. Once we have covered these essential aspects of raising a puppy, you will be well on your way to having the most obedient, well-behaved, and happy dog in your neighborhood and family!